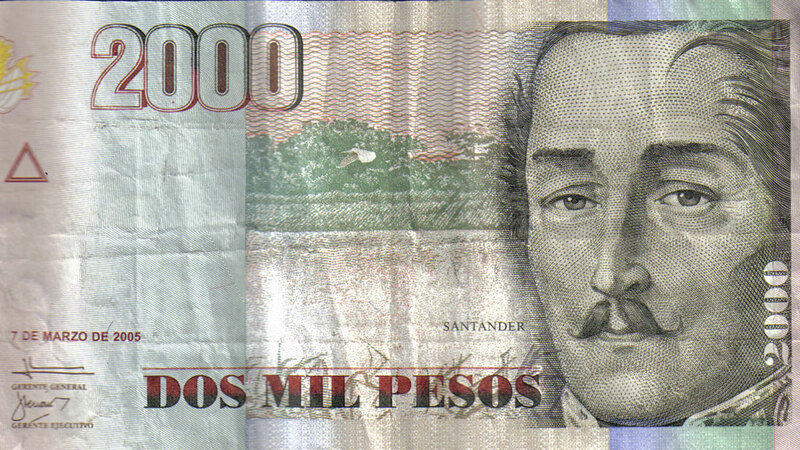 Colombia’s peso is one of the world’s worst performers against the American dollar as 2015 commences. The consequences of this are varied and difficult to predict. One dollar could get you 2,450 pesos at the close of business on Monday. This is the highest figure since 2009; incidentally the last time that Brent crude oil dipped below $50 per barrel. The Colombian peso was the fourth worst performing national currency against the US dollar in 2014. This decline steepened during a turbulent final quarter of 2014, with the peso losing approximately a quarter of its value against the USD in this time. Only the free-falling Russian ruble lost more ground against the dollar of all 31 major world currencies during this period. This plunge could benefit areas of the nation’s export sector however, as Colombian goods will now be cheaper and more competitive globally. Colombia’s Finance Minister said that a devaluing peso “is a breath of fresh air for manufacturing businesses, flower exporters, for the rest of the agricultural sector” to La Republica just over a month ago. While the devalued peso may aid certain exports, oil is likely not one of them. Oil fortunes and the pesos strength are closely tied, oil constituting over half of national exports and foreign investment. With oil prices sinking and the global oil situation unstable, it is unlikely that a devalued peso will entice foreigners to increase investment in Colombian oil. “If the oil market continues to record declining contributions…the Colombian exchange rate shows favorable conditions to reach 2,600. A level that could be reached by February,” newspaper El Espectador quoted the department of economic research at Alliance Securities as saying. Inflationary pressures will stem from the devalued peso, the minutes of the Colombian central bank’s latest policy meeting stated on Friday. The amount of inflationary pressure was not specified, although it was said that the currently strong domestic consumer demand may compound it. The central bank does have some flexibility to work with it’s inflationary level however. Colombia is the only major South American country currently within its inflation target range. Colombia exhibited 3.66% inflation at the end of December, comfortably within the desired 2-4%. The meeting’s substance aligns with the Finance Minister’s acknowledgment that “the process of devaluation has been very accelerated, and we have to observe this constantly, which is something we do alongside the central bank, to ensure that … absolutely nothing occurs which could generate negative effects” to RCN radio on December 11.